Ring Floodlight Cam vs Spotlight Cam vs Stick Up Cam: What's Different? Ring Floodlight Cam vs Spotlight Cam vs Stick Up Cam: How are they Different? Do you really know what happens right outside your home? All it takes is one snoop peeking around your front porch in the middle of the night for you to be passionate about home security. In this article, I’ll go over a few great options from Ring for securing the outside of your home. To keep you informed on everything going on outside your home, Ring offers several weatherproof cameras. We will compare Ring Floodlight Cam vs Spotlight Cam vs Stick Up Cam in this in-depth Ring camera comparison. This infographic will introduce you to the differences, which we’ll expand on below. Ring – maker of the easily recognizable video doorbell – is on a mission to help you see, hear, and speak with anyone outside your home. In recent years, the company added a new product to its line-up: the Spotlight Cam, with either wired and battery power. This addition expanded on the previously released Stick Up and Floodlight Cams. There are a few similarities when it comes to all of these outdoor cameras. We will review those after we dive into the major pros and cons of the Ring Floodlight Cam vs Spotlight Cam vs Stick Up Cam. With built-in floodlights and a siren, the Ring Floodlight Cam is made to illuminate your home and scare away intruders. It’s a heavy-duty solution and will cost you more than the other Ring cameras, but it also offers additional features for ultra-strong security. With two powerful floodlights on board and a 110-decibel alarm (which is the average human pain threshold), this camera can light up dark corners and send a convincing signal that you’ve spotted someone on your turf. Unlike the other options in Ring Floodlight Cam vs Spotlight Cam vs Stick Up Cam, the Floodlight Cam has to be hardwired. Make sure you install it somewhere that you can easily get power to. Ideally, you will replace an existing floodlight and already have a standard junction box set up. Above the garage: Provide ample light when you pull into the driveway, or light up the front of your home if someone or something crosses in the path of the Floodlight Cam. Outside your back door: With dual floodlights and an alarm, you can easily scare off intruders or wildlife that wanders up to your home’s back porch. Shed or barn lighting: Make it easier to work outside the shed or barn in low-light conditions with the Floodlight Cam. Plus, you’ll have the peace of mind of knowing you can have a live view of the outlying building at any time of the day or night. Note that if it’s too far from your router, the floodlight cam cannot connect to Internet. For a more minimalist look that still provides plenty of security, Ring’s Spotlight Cam is the way to go. 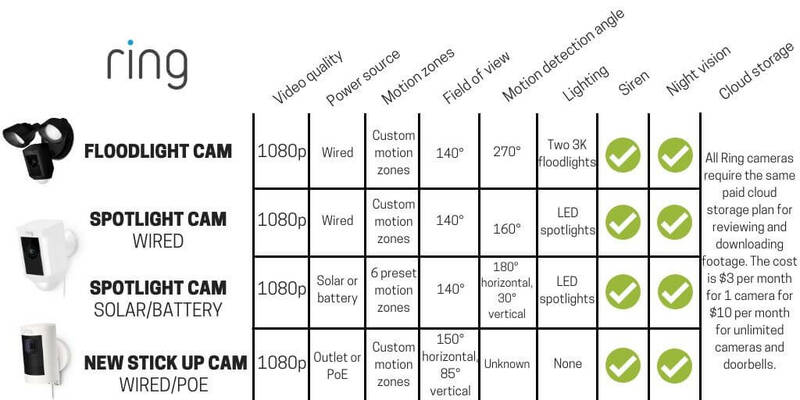 When looking at this comparison of Ring Floodlight Cam vs Spotlight Cam vs Stick Up Cam, the Spotlight Cam has plenty of features similar to Floodlight, at a lower price. It also offers battery or solar powered versions, which is ideal for those who cannot wire their camera. Offers 3 different models with unique power source options**: Spotlight Cam Wired, Spotlight Cam Battery, or Spotlight Cam Solar. Make sure you buy the version that you want for your home. 2 small, motion activated lights built-in. These are on the sides of the Spotlight Cam. Seriously though, you can take advantage of the multiple power source options to place this camera in a variety of places around your home’s exterior. If you opt for the Spotlight Cam Solar, just make sure it’s in a spot that typically gets a few hours of sunlight per day. At the side of your home: Discourage prowlers from sneaking from the backyard to the front of the house undetected with a Spotlight Cam on duty along the side of your house. While you may not have a window here, you can still gain visibility with the live video feed, spotlights, and alarm at your disposal. When a floodlight is too bright: If you have a light sleeper in your home and don’t want the harsh glare of floodlights waking anyone up, consider the Ring Spotlight Cam as a better solution for motion-activated light. The spotlights will still illuminate the area and allow you to see who or what is outside, but without the mega-power of the floodlights onboard Ring Floodlight Cam. If you want standard outlet power: While Ring Floodlight Cam connects to your junction box, Spotlight Cam Wired plugs into your standard power outlets. This offers the perks of continuous power, without requiring complex wiring from an electrician. 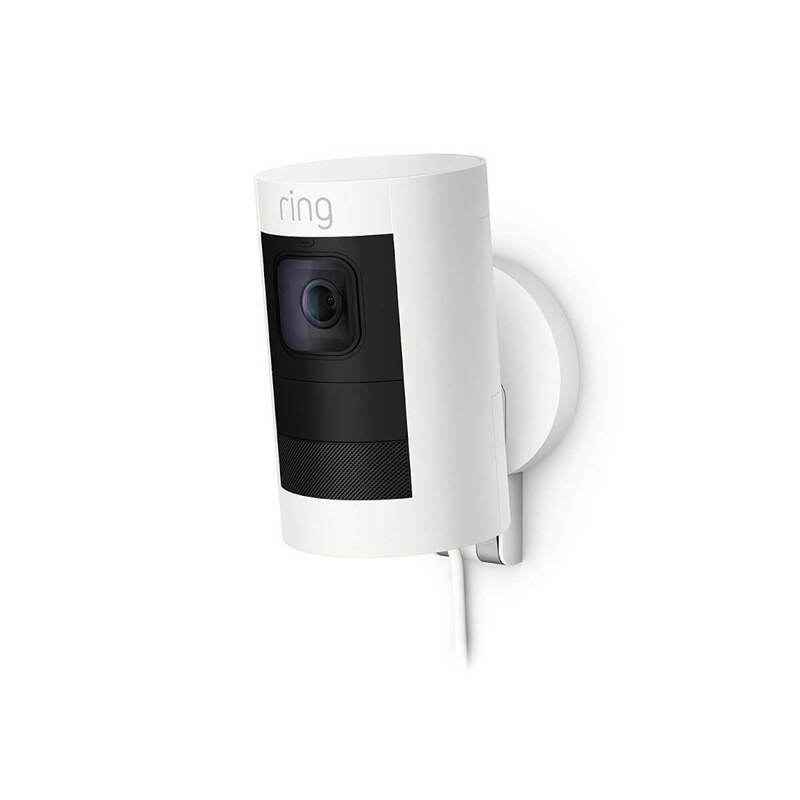 Ring Stick-Up Cam is the tried-and-true original that got Ring involved in security cameras in the first place. UPDATE: Since we first published this Ring camera comparison, Amazon released an all-new version of Ring Stick Up Cam. It includes upgrades like 1080p footage, custom motion zones, and a siren. All of these features are missing on the original Stick Up Cam. The biggest game changer in our All-New Ring Stick Up Cam review is the option for Power over Ethernet (PoE). This hardwires both power and a strong internet connection into your camera. Say goodbye to spotty internet. You won’t have to worry about your cameras disconnecting from your WiFi. This is a big benefit of the Ring Floodlight Cam vs Spotlight Cam vs Stick Up Cam. The all-new version is upgraded and costs the same, so make sure you opt for that one. It’s designed as an indoor/outdoor camera for you to use anywhere that needs monitoring. Original Ring Stick Up Cam on the left, all-new Ring Stick Up Cam on the right. If you’re not interested in the heavy-duty Spotlight and Floodlight cams, the All-New Stick Up Cam is the simplest way to go. 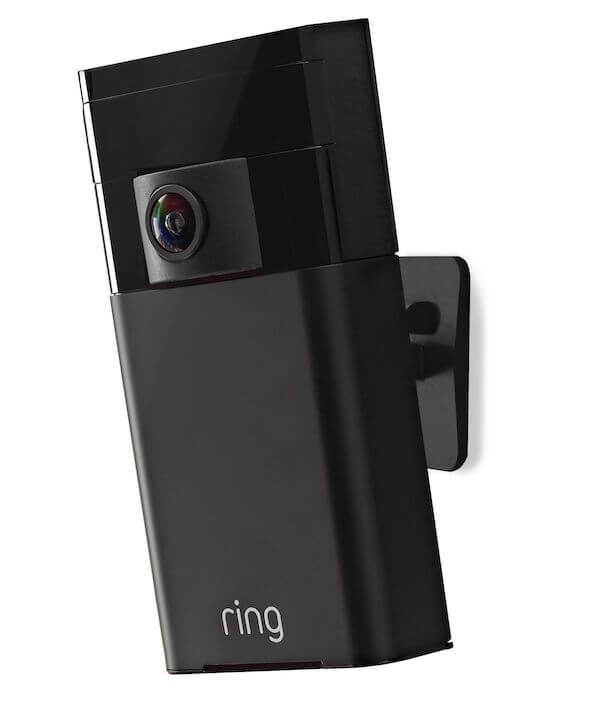 Ring claims this camera can be installed to any surface. The various power supply options (including PoE), flexible mounting solution, and smaller size of the Ring Stick Up Cam give you a lot of choices in where to use this outdoor camera. Along a fence: If you want to keep an eye on the activity inside the perimeter of your privacy fence, mount the Stick Up Cam to the fence and let it keep track of the kids playing kickball or whether anyone is cutting through your yard uninvited. On the porch: If you don’t have a Ring Video doorbell but still want to keep tabs on who is knocking at your door, then the Stick Up Cam can give you a live feed of your front porch activity. While you won’t have the full smart doorbell experience Ring is famous for, Stick Up Cam’s two-way audio still allows you to see and talk with anyone that triggers the motion detection on the camera. If you run an ethernet cable to the camera, then it will have steady, reliable PoE so you won’t have to depend on WiFi connection. Anywhere that lacks a power supply: If you buy the battery version, you can put this camera virtually anywhere that you want to keep tabs on. Unlike hardwired cameras or those that must be plugged into an outlet, the Stick Up Cam Battery carries power using a local battery. As long as your WiFi or PoE connection reaches the camera, it’s a good place to install the Stick Up Cam. You can buy several Stick Up Cams and secure your home’s perimeter, or even move one inside if you’re done using it on the exterior. With the differences established earlier in this Ring camera comparison, let’s dive into the features that you can expect on any of the cameras. HD video recording in 1080p. All of these cameras have 1080p quality, which is great for distinguishing faces. Motion-activated recording and notifications. When any of these Ring cameras see motion, they will begin recording and send you a notification. Night vision. This is essential for securing your home after dark. Live camera view. View your cameras via the Ring app. You can also share recorded videos with your neighborhood, which is a big perk in tracking down perpetrators. Two-way talk. With a microphone and speaker built-in, you can easily talk back and forth with any guests. Smart home compatibility. Ring works with Wink, SmartThings, Alexa, IFTTT, and more. Paid cloud storage necessary. If you want to view recordings, you can count on paying Ring’s monthly cloud storage fee. View 60 days of history, share it with others, or save specific recordings for $3 a month for a single camera or $10 a month for unlimited cameras. 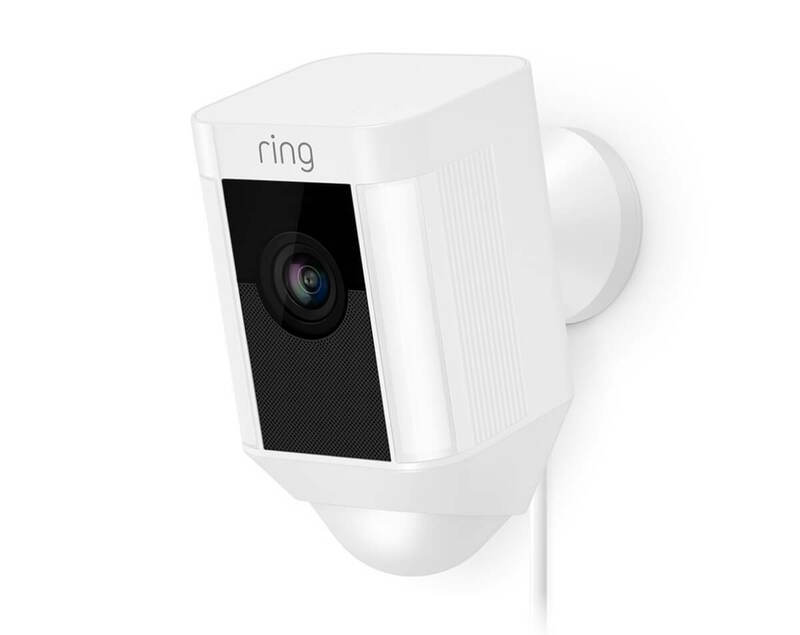 Which Ring outdoor camera is my favorite recommendation to keep your eyes (and ears) on everything happening around your home? 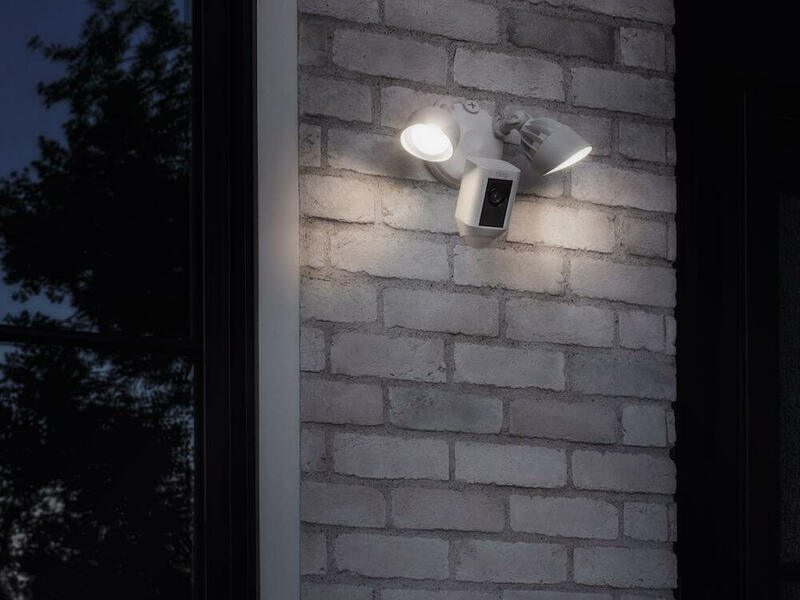 I would choose the Floodlight Cam for replacing a floodlight, but the answer really depends on your biggest objective with an outdoor security camera, including what other outdoor smart home gadgets you have installed. You want to replace your current floodlights while adding security and a siren. For this Ring camera comparison, Floodlight Cam is my top pick for homes that are on dark streets in rural areas. There’s a reason it’s rated highly by Tom’s Guide and others. This is a high-quality outdoor security device. The Floodlight Cam is also my top pick if facial recognition technology (which can reduce false alarms) is important to you – since this is the only one in the Ring Floodlight Cam vs Spotlight Cam vs Stick Up Cam comparison that offers this. You value the ability to add extra light to an area when motion is detected, but you don’t want (or need) floodlight-level illumination. Homes with well-lit streets may find Ring Spotlight Cam to be a suitable option. 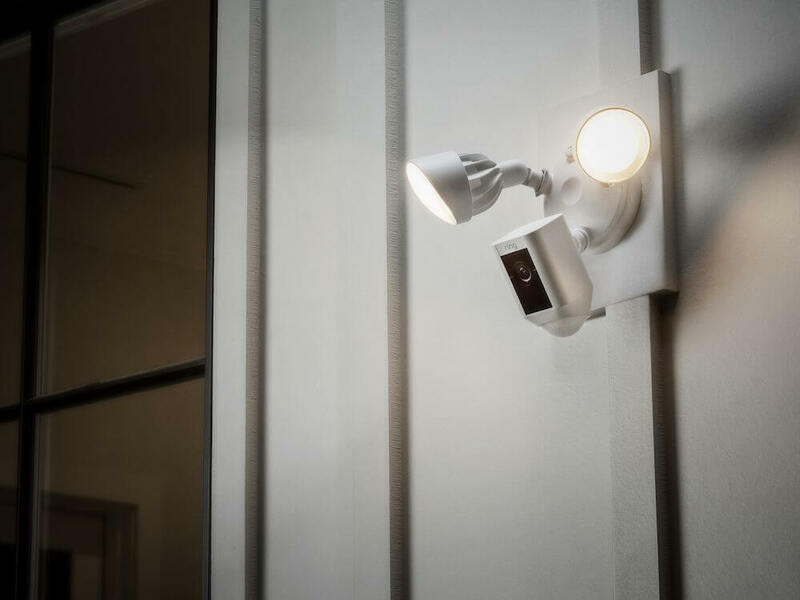 The Spotlight Cam is also a better choice over the Floodlight Cam if you don’t want the hassle of worrying about having to hardwire the camera – or you don’t want to replace your existing light fixture. We also love the solar option with this camera. You want the most affordable option that still offers plenty of features. Power over Ethernet is only available on the Stick Up Cam. If you want that feature then Stick Up Cam is the one for you. Besides a built-in light, it has most of the major features of the other Ring cameras, including 1080p, a siren, and a wide field of view. 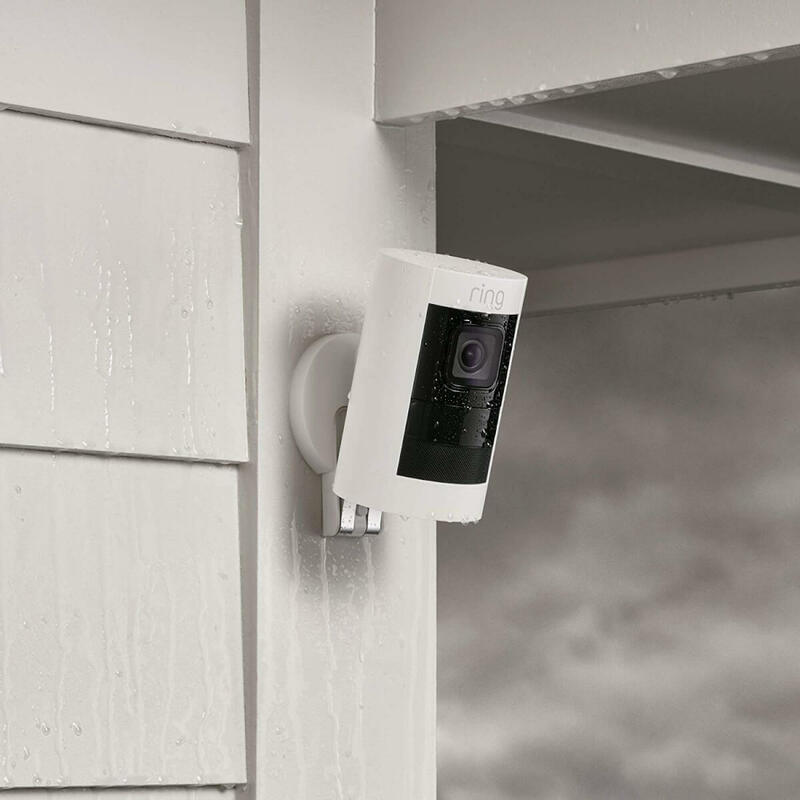 There are a few other options for outdoor cameras offered by Arlo and Nest. These each have their own advantages: Arlo offers 7 days of free cloud storage, while Nest is very compatible with other smart home tech. With more and more ways to keep an eye on the security of your home, which Ring camera will you choose when making the choice between the Ring Floodlight Cam vs Spotlight Cam vs Stick Up Cam? Let us know in the comments below! Don’t bother with the Stickup Cam. It will pick up every trash truck, UPS truck, etc. that drives by – but no people. It senses people walking up your driveway, but it doesn’t start recording until they’ve already passed by the unit – no matter how you adjust it or change the settings. It will record them walking back down your driveway with your property, but you can’t see their faces. What good is that? A complete and utter waste of money. Thank you letting the difference between 3 ring cameras. Just want to know which one is the wider range and face recognition ring camera. I already have just a flood light no camera. Is spotlight better or stickup cam.